China as a global force for investment has been well documented. From power stations to megaresorts to infrastructure projects, there is hardly a nation that has not received some form of financing from the world’s fastest growing economic powerhouse, The Bahamas included. 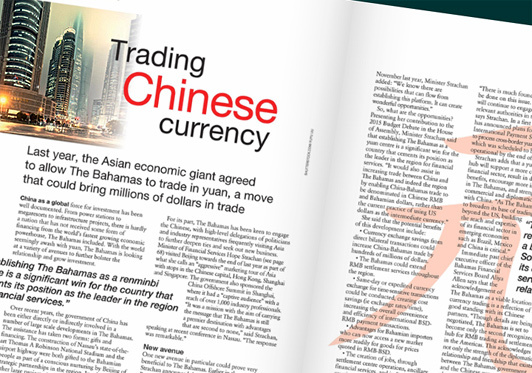 With the world seemingly awash with yuan, The Bahamas is looking at a variety of avenues to further bolster the relationship and grow investment. Over recent years, the government of China has been either directly or indirectly involved in a number of large scale developments in The Bahamas. The assistance has taken two forms: gifts and financing. The construction of Nassau’s state-of-the- art Thomas A Robinson National Stadium and the airport highway were both gifted to the Bahamian people as part of a conscious nurturing by Beijing of strategic partnerships in the region. Involvement in other large projects, including Baha Mar, has been in the form of state funding through the Exim Bank of China and construction through China State Engineering Corp.
• Currency exchange savings from direct bilateral transactions could increase China-Bahamas trade by hundreds of millions of dollars. • The Bahamas could extend RMB settlement services throughout the region. • Same-day or expedited currency exchange for time-sensitive transactions could be conducted, creating cost savings (ie exchange rates/time), increasing the overall convenience and efficiency of international BSD- RMB payment transactions. • Advantages for Bahamian importers who can now access a new market more readily for goods for prices quoted in RMB-BSD. • The creation of jobs, through settlement centre operations, ancillary financial services, and indirect job creation through increased trade and investment with China. • Positive impacts on goodwill, business cooperation, trade and investment between China and The Bahamas. How close The Bahamas is to realizing these benefits is not so clear. “There is much foundational work to be done on this issue. My ministry will continue to engage with the relevant authorities in this effort,” says Strachan. In a first step, China has announced plans for the China International Payment System (CIPS) to process cross-border yuan transactions, which was scheduled to become fully operational by the end of last year. Apart from encouraging more trade relationships and exports given the ability to settle in RMB, there is the potential for Bahamas institutions to invest directly in yuan denominated bonds and securities without the downside of conversion.